Today, when you order "BACK TO THE LAUNCHING PAD by Michael Breggar", you'll instantly be emailed a Penguin Magic gift certificate. You can spend it on anything you like at Penguin, just like cash. Just complete your order as normal, and within seconds you'll get an email with your gift certificate. Michael Breggar, the award-winning author of "Auto-Magic" (seen monthly in The Linking Ring) is back with another collection of amazing, fun and well-constructed magical pieces. As in his previous best-selling book the "Five Roads to Vegas," some the effects have been previously published, but they have been further refined with more detailed explanations and performance notes. True to the "Auto-Magic" mantra, the routines in this book are professional and practical yet none require sleight of hand. As Michael always stresses, since the performance is the effect, the tricks need to be clever, layered, deceptive and, most of all, entertaining. Michael helps you navigate through each routine with careful descriptions and well-honed patter. However, you can easily adapt each effect to your own style. "Updates on classics with new twists at every turn with surprises guaranteed to kick the slats out from underneath your audience. 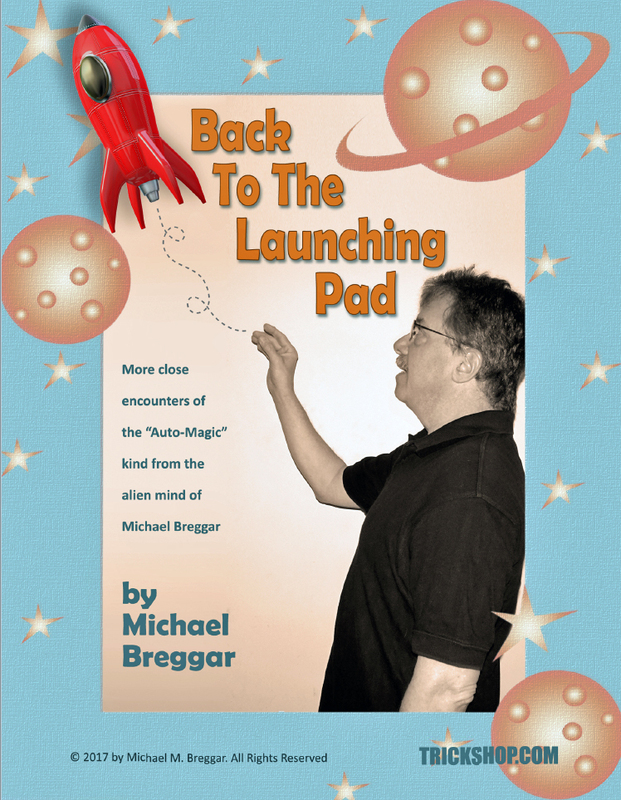 More than card tricks, "Back to the Launching Pad" includes mentalism and more. Well written, clever variations, and commercial presentations." Scott Wells, M.I.M.C. with Gold Star and Host of "The Magic Word Podcast"
Back To The Launching Pad - Michael’s addition the "Out of this World" landscape, with a big difference…it’s done with the cards face up! Already a favorite of several working pros. ACAAN Opener – An old principle on top of an old U. F. Grant card trick turns it into a funny, yet still amazing Any Card at An Number effect. A Whole Empty Brain – Yet another old card principle that has been redressed and relayered to surprise even the knowledgeable. Two spectators show they are in mental sync by a very fair selection of cards from a shuffled deck. Not only are their cards mates, the rest of the deck suddenly turns blank! Not Just Another Book Test (A.K.A. "The Two-Fingered Book Test") – Michael received an amazing amount of emails on this effect. Finally, a book test that seems organic and makes contextual sense. Or were the emails more about the "AKA" part of the title??! The Dating Game – Playing around with yet another old principle, Michael conjures up a fun effect where famous couples’ names are listed on index cards. The cards are then torn in half and fully mixed, thus "separating" the couples. Using random throws of dice, the spectators magically reunite the couples. Usually! Mixed Emojis – based on a Dan Harlan version of a Martin Gardner concept, a fabulous three-phase routine is demonstrated using domino-sized tiles depicting mobile phones with everyone’ favorite excuse for not typing complete text messages! Cra-Ker-Jack – Michael invents a ridiculously bizarre and funny new casino game, with rules that change on a whim. The spectators are treated to an amazing routine of card magic where their random decisions find the mates to four selected cards and ultimately produce the four aces. The Price Is Write – From Michael’s corporate repertoire, in figuring the "best price" for a silly-looking pen, the spectators write out all different prices on price tags. Through a very fair and random process of elimination, one tag is selected. The price on the tag exactly matches the amoiunt of change in a small envelope, sitting on the table untouched from the beginning. Drawn Conclusion – Michael’s favorite trick and frequent closer. From a shuffled deck, a spectator selects a face down card. They place their fingers lightly on top in an effort to read the card through their fingertips. The magician then tries to read the reading and draws the image on a paper. Is it the correct card? Well, sorta. Plus, two essays written in Michael’s breezy style with more tips and presentational ideas than you can shake a stick at. If that’s your idea of a good time. This is the sequel to Michael's first book, The Five Roads to Vegas, and has just over 50 pages of relatively self-working magic (Breggar prefers the term auto-magic) with some great presentation ideas. Once again the tricks that are taught have two important bookends that are well worth reading, including a brief introduction that has some helpful things to say about self-working magic. The book concludes with another essay entitled "Stuff You Don't Want To Read But Really Should", in which Michael explains his own approach to producing new magic effects, by starting with the presentation, and then working backwards by considering the method. The opening trick that gave the book its title is a real highlight, and offers a fresh approach to Paul Curry's classic "Out Of This World", where the spectator sorts out the red and black cards face-up while blindfolded, only to discover that they have actually sorted out cards with two different coloured backs. The surprising revelation of a card in "Drawn Conclusion" is also a favourite for many, including the author himself. But I especially loved the ingenious use of the 10-20 force in combination with a blank deck in "A Whole Empty Brain". Besides these three tricks, there's another half a dozen solid routines, including a book test, and a trick with a collection of mini cell phones with cartoon Emojis. Michael has a very conversational writing style that makes this a fun read. I especially recommend this book to anyone who is interested in some novel presentation ideas, and who enjoys magic that is easy on sleights and big on presentation.